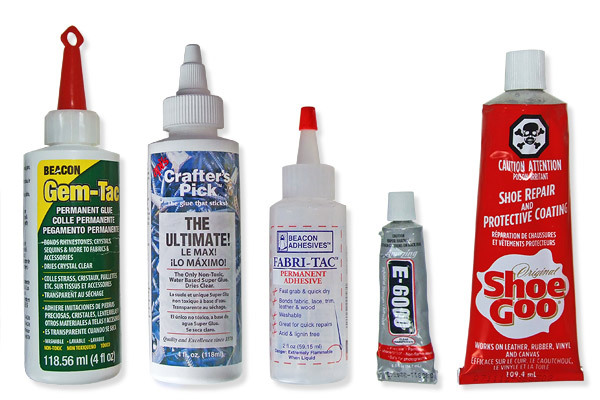 Adhesives tested E-6000, Shoe Goo, Gem-Tac, Fabri-Tac and Crafters The Ultimate pick. It’s important to stress that while all the adhesives may give a good bond between crystals and fabric the purpose of this test is to determine which adhesive gives the strongest bond. To determine this the crystals were glued using the 5 different glue types each with their own colour crystals and then left for over 24 hours to dry. 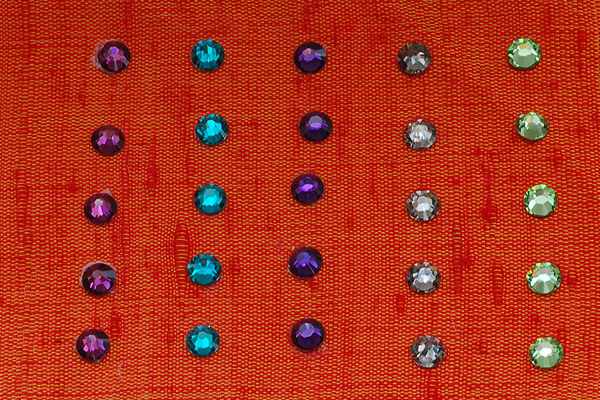 To test the bond strength the crystals on the fabric were then roughly stroked over continuously until crystals came loose. For some materials the bond was very strong resulting in the crystals being quite difficult to remove the fabric was scrunched up and rolled into ball and roughly handled until crystals were dislodged. The other test used to determine the bond strength between the flatbacks, adhesive and fabric was to pick at the crystals to see how difficult it was to remove them. Picking at the crystals is pretty much the same principle as catching them on something which will happen from time to time, so hopefully this gives a fair impression of which adhesive performs the best on each material. There are numerous forums, websites and blogs that recommend each of these adhesives which is why I choose them as they represent the most popular adhesives used for bonding Swarovski flatbacks to fabric (Shoe Goo is the only one I haven’t seem mentioned anywhere but its made by Eclectic Products who make E6000 so I wanted to see what the difference between the two adhesives were). Shoe Goo – Made by the same company as E6000 with the same warning and more it contains Perchloroethylene which is why it has a nice skull and crossbones / Poison Irritant warning at the top of the tube. Would recommend using a mask as mentioned above when working with Shoe Goo and the chemical should not be inhaled. As regards the glue it’s clear like E6000 but not as thick so slightly easier to apply, it also dries quite quickly but not as fast as E6000 but it’s also necessary to hold the crystals in place for a few seconds for the adhesive to get a good bond. Gem-Tac – It’s white in appearance when it comes out of the tube but dries clear, its non toxic and a lot thinner than e6000. If you find it too thin you can put some into a container and leave to thicken up for a minute or two or alternatively leave the top of the bottle for a few days and it thickens up nicely. When it’s new it may require the use of an orange stick to release the crystal from a jewel setter/ sticky bud tip. If you intend to use the adhesive on a curved surface leave the adhesive for a minute or two before applying the crystals or they may slide while the adhesive is first applied as it’s runny. Crafters Pick – The Ultimate – Looks the same as Gemtac but slightly thicker in consistency, it also dries clear and is non toxic and may require the use of an orange stick/cocktail stick to release the crystals from a jewel setter tip. It’s easy to use but doesn’t provide half the strength of bond that Gemtac does but maybe it will perform better on plastic, metal or glass (we shall see ; ). Fabri-Tac – Made by Beacon Adhesives the same company as Gem-Tac this glue is clear in colour, has strong fumes and most importantly is not gem friendly. It’s like working with sticky slime that stretches like melted chewing gum and when you try and remove a small amount for a crystal it’s no easy task. It gives a very quick bond but it’s not as strong as Gemtac on any fabric that I tested and I certainly wouldn’t have the patience to use it for many crystals. 1. 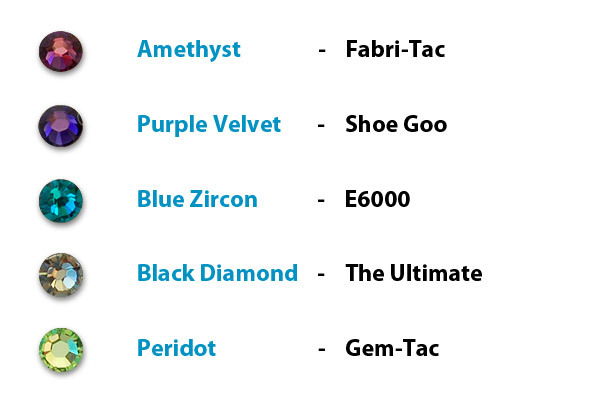 Faux Suede – The strongest is Shoo Goo closely followed by e6000 which both gave a very strong bond, with enough force the Gem-Tac, Fabri-Tac and The Ultimate crystals came loose. None of the crystals that didn’t come loose were easy to pick away though. 2. Wool – The strongest is Gemtac with e6000 also giving a pretty good bond, both Fabri-Tac and The Ultimate glue were easy to rub the crystals of the wool so I wouldn’t recommend either of these. 3. 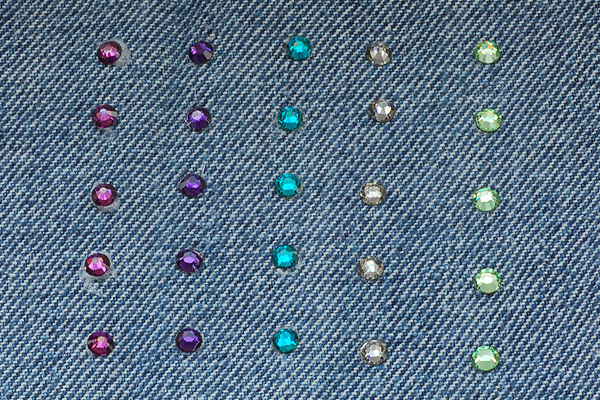 Denim – Fabri-Tac was the first to rub off followed by The Ultimate crystals. All three of the remaining adhesives gave a very strong bond and after trying to pick the crystals off one of the e6000 crystals came loose but the Gemtac and Shoo Goo all stayed on. 4. Silk – Fabri-Tac was the first to come loose followed by The Ultimate and Gemtac neither Shoo Goo or e6000 came loose and both were difficult to pick off with e6000 being slightly stronger. 5. Faux Leather – Again Fabri-Tac was the first to come loose, followed by The Ultimate and then Gemtac once I started to pick at the crystals followed by E6000 and Shoe Goo. 6. Linen – The Fabri-Tac crystals came loose pretty quickly from rubbing followed by Shoe Goo. The Ultimate came loose after using a nail to scratch at the crystals followed by E6000 with Gemtac giving the strongest bond. 8. Soft Leather – None of the adhesives were particularly strong on soft leather but the strongest was Gem-Tac, although all of them were easy to pick off. 9. Canvas – Fabri-Tac gave the weakest bond coming free from just rubbing the crystals all the other adhesives gave a pretty strong bond. The Ultimate came loose quite easily with picking followed by Gemtac which didn’t come loose very easily. Both E6000 and Shoe Goo gave a very strong Bond. 11. Leather Belt – All of the adhesives provided a good bond Fabri-Tac, The Ultimate and Gem-Tac were the easiest to pick off. Both E6000 and Shoe Goo performed very well and weren’t so easy to pick off either. Hope you found this useful I will be posting the test video as soon as I chop it up. You done a good job of the comparision of the rhinestone glues. It is very clear to let us know which glue for which material. I would like to have a question. 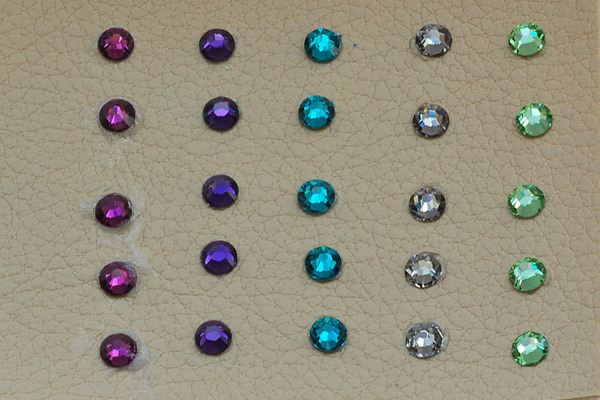 Do you know what is the composition of the hot fix rhinestones. Is it same as the above glue? 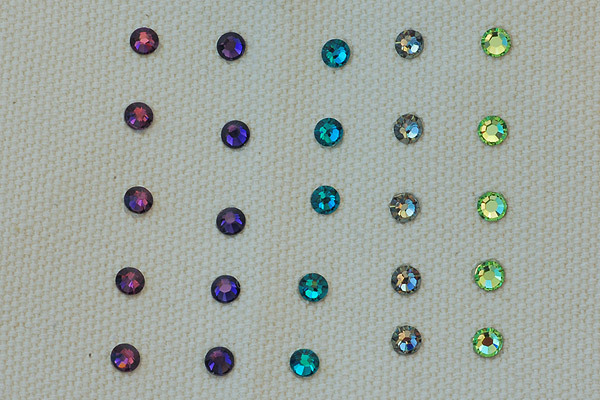 How the hot fix glue make on the back of rhinestones? The Hotfix Glue gives a strong bonds with fabrics, paper or card but is not suitable for other surfaces, the actual adhesive isn’t stuck to the back of the foil directly but has a primer between the two layers. You can find a list of what materials hot-fix is suitable for here. Hello, Khaled. I´ve been reading your articles and I must say that – until now, they are the easiest and best explained that I´ve found related to Swarovski´s crystal. Everything is very useful! Congratulations. I would like to take this occasion to also ask your opinion about this Glue Related Post. I work with strong glues on daily basis and my worry is that can affect my clients – as I make dogs and babies accessories which stays close to their face. Could you, please, if you can, to clear this up for me?? Hi Flavia Gemtac is a pretty safe glue as its non toxic and shouldn’t cause any harm, but e6000 on the other hand is a different matter as the glue does have some chemicals that are toxic. You can find the e6000 Materials safety data sheet here and the e6000 technical data sheet. 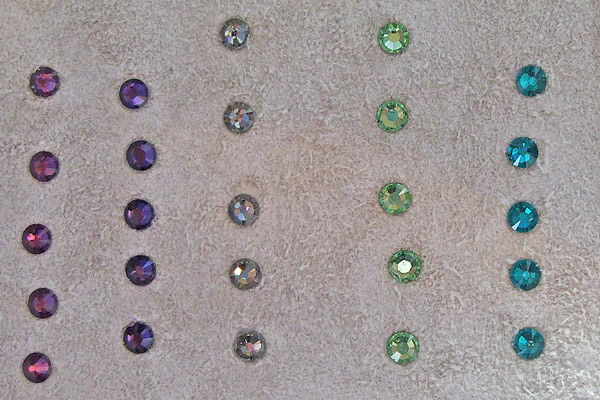 The alternatives would very much depend on the surface you are applying crystals to, for dig collars you can consider Rose pins (we have them in stock and will have on the site as soon as I get a chance) They are flatbacks with a prong backing which are suitable for leather. There is a also Swarovski’s own adhesive CG500 which I haven’t tried yet but will be getting some to test soon. For baby footwear gemtac would be a safet option and for clothing its worth trying hotfix crystals to see how you get on with them. I’m currently attempting a DIY project involving wine glasses and swarovski flat back crystals. I’m trying to find the best glue to hold the little gems on the glass! If I can find something that can also be handwashed too (or at least come in contact with water) that would be great! Hi Kiki I have done a glass tutorial but not had a chance to finish it off as have had a bit of a disruption the last 3 weeks. As regards glue for wine glasses gs hypo cement, gemtac and e6000 all work well. The all last fine in warm soapy water afterwards, the one deciding factor for using e6000 or gemtac over gs-hypocement is that both of the first 2 glues are flexible while gs-hypocement will crack if it takes a knock which glasses are likely to do in a washing up bowl. Hi. I want to add Swarovskis to my key ring. It’s a chrome finish. Would e6000 be suitable. What prep etc would be needed for it. ,any thanks! 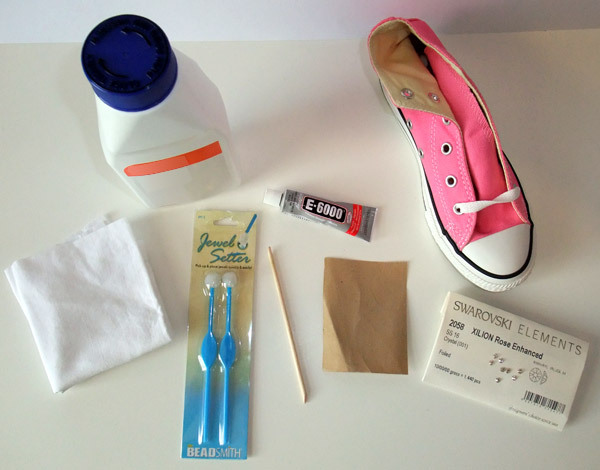 Can you mix paint with e600 or buy coloured glue suitable for converse? Hi Charlie You can mix colour with e6000 but it will change the properties of the adhesive and therefore wont be as strong. A better solution would be to colour the toe with a permanent marker underneath the crystals or to use ultra fine glitter to fill any gaps. 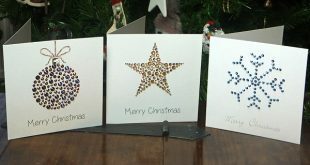 Gemtac is easier to use with glitter as it doesn’t dry as quickly as e6000. 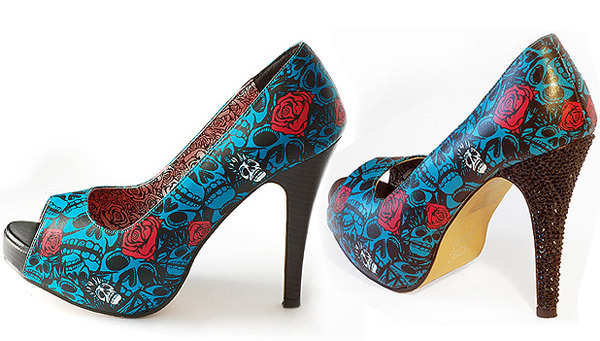 What glue would you recommend for the sole of a high heel shoe? All it says for the material is synthetic. You should be able to use gentac or e6000, with e6000 it has strong fumes and is quite thick so i have found that you have to press the crystal into the adhesive for a few seconds to get it to bond well on a fabric with fibers otherwise it will come off quite easily. With Gemtac its a lot runnier so seeps into the fibers easily but if its a new bottle and you start adding crystals to any surface that is not flat, they will start to slide before the glue dries. So depending on how warm the room its best to test a few crystals at a time to see if they move, if they do leave the glue thicken for a few seconds/minute on the next test before adding the crystals. Hello there, just wanted to share that I absolutely love Wal-Marts “jewel-it”glue manufactured under the Aleene’s brand, I just did a wedding dress with 1000+ stones and I could lay glue for 15-20 and then lay the stones, dries perfectly clear and has a great medium consistency. Many thanks for the recommendation will have to see if they stock it in the UK. Rose pins or rivets would be the answer, we are ordering in the tool for applying them so should have on the site in the next few weeks. I just wanted to ask what glue is the best for use on cotton. I would love to re-use some of my old clothes to add a bit of bling to them! I would probably opt for hotfix crystals if you are using on clothing, we will be doing some hotfix tutorials soon which will hopefully give you some ideas. Hi! 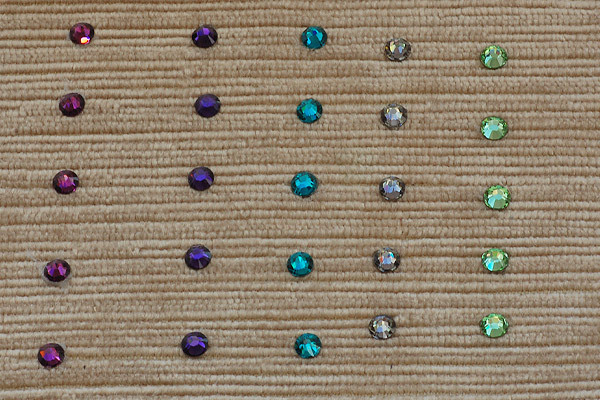 I want to adhere swarovski flatbacks to a velvet Irish dance costume. At first I bought E6000, but am now not keen to use it as it seems it is a carcinogen and even banned in some countries. I don’t like working with such toxic glues. I have now bought gem-tac but hear conflicting opinions on using this to stick to velvet. It seems velvet is very difficult for stickability and now wonder if I should have just purchased sew on crystals. I see you did the velvet test and it seems gem-tac came out the best. Did any crystals come off with the gem-tac? Gemtac will work but I usually leave the top of the bottle for it to thicken up the other alternative is hotfix crystals, but if you use there you need to make sure that the glue melts before you press them onto the dress or the crystals will soon fall off. Hi Crysti Which adhesives have you tried have you considered rose pins I have tested them on candles and they work nicely, you just push the pin through the wax and it stays in place no worries of it coming loose or nasty chamicals beig burnt if someone doesn’t remove the crystals. What glue works best with glass? I would like to decorate a wine bottle. You can use gemtac, GS Hypo Cement or e6000, GS Hypo is the easiest to use but it’s brittle if it takes a knock and the crystals will come free, the other 2 don’t suffer as much with this issue as they are both flexible once dry. I am making costumes for synchronized swimming. I have used Gem Tac for a few years now. But it had never dried up completely. So the swimsuits are always sticking to each other if you don’t keep them out and straight all the time. I don’t know what could be wrong. I live in a humid climat. Could that be a problem? Hi Olga The gemtac shouldn’t remain tacky unless the temperature is VERY HOT where you live. I will try in the new year testing some adhesives and hotfix crystals on a swim suit and see which last the longest with the chlorine. What would you recommend for Synchronised costume? Hi Lim, Hotfix would be the recommended crystals for a swim costume, you would have no mess from adhesive and a good strong bond. i was wondering the best crystals and glue for leather horse tack. (halters, bridles, breastcollars,) would you know??? Hi Of the adhesives tested gemtac seems to be the most suitable for leather, e6000 works for some leathers but not so good for equestrian equipment. Gemtac will give a pretty good bond as long as the leather is grease free when the glue is applied. The bond with the crystals and leather will come apart if the leather is excessively buckled or bent. 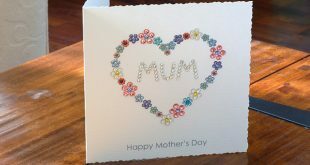 The alternatives are to use rose pins which are crystals with metal prongs on the back which can go through the leather or rivets both of which are very secure but need a special tool, so if its a one off job it wouldn’t be cost effective to use either alternative. Hi, I am looking for a strong glue to glue swarovski crystals onto rubber. I do not want to use a glue such as e6000 because of the toxins it contains. 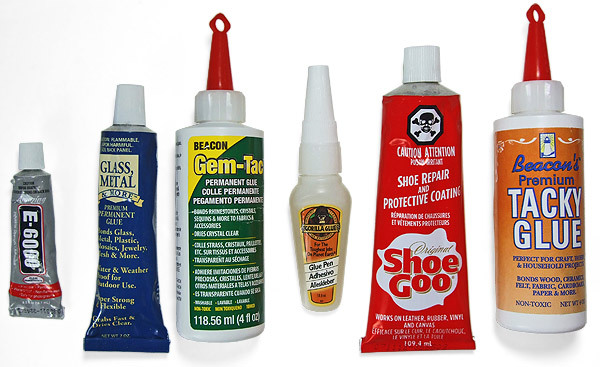 Can you recommend any safer glues to use? Thank you. Is the rubber footwear or something else? Hi what is the best glue to use on plastic emblems for cars regarding rain and heat??? It looks like chrome but it is plastic. You can use UV6800 which is like e6000 but for outdoor use or you can look at epoxy resin which will set the crystals into place permanently. If you do decide to use epoxy, you will need quite a slow curing resin and be aware that it does skin once it starts to harden. Hi i’m interested in crystallizing a resin animal head. Do you have any suggestions for the glue and type of crystal? thanks so much! 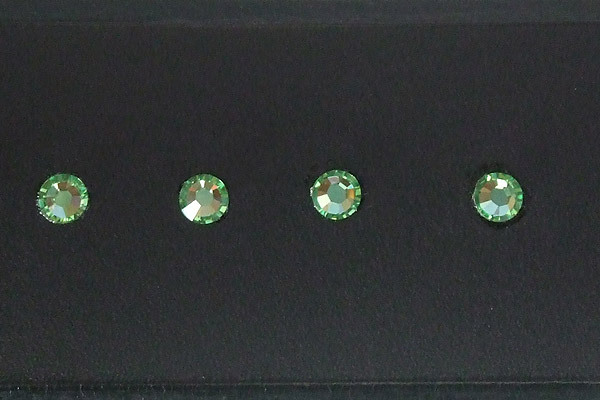 You would use non hotfix flatback crystals which you will find here http://www.crystalandglassbeads.com/19-swarovski-flat-back-crystals-non-hotfix as regards glue there are 2 adhesives that would work, gemtac and e6000. Of the two e6000 would probably be the easiest to work with as it’s thicker in consistency, while gemtac on the other hand can be runny on curvature and unless you leave the adhesive to thicken for a minute the crystals can slide. The downside of e6000 is the fumes and it does yellow slightly over time through UV where gemtac has no fumes and doesn’t discolour. I wanted to know if there was a glue preference for tulle ? Hi Lauren Gemtac works well with Tulle or alternatively if it’s something that you will be doing a lot of you can consider hotfix crystals but you have the expense of an applicator tool then. Hi, I would like to know what glue would be best to use for applying gems to glass and curved? I tried e6000 and found it extremely difficult to use and actually after 2 days of drying i picked it off with no force what so ever !! Can you help? I prefer gemtac on glass although both adhesives should give a strong bong and certainly did in the tests I have previously performed. It will be worth degreasing the surface first with some rubbing alcohol to make sure there is no washing up liquid traces or anything else on the glass before crystallizing. I used gemtac in this glass tutorial how to crystallize a glass. The one thing with gemtac is that if its a new bottle its quite runny, so apply a small amount for the first row ( I use a cocktail stick) and leave for a minute or so to thicken, then apply the crystals. Once the first row or 2 is done the crystals wont slide so start from the bottom of the glass and work up. If to only want the top of the glass crystallized turn the glass upside down and work from the top rim (which is now the bottom of the glass) upwards. My daughter wants to put crystals on the Nike symbol on the side of her running shoes. What glue/adhesive would you recommend? I’m not really sure of the material, but it looks leather. I have found that gemtac glue gives the best bond to leather, it also makes a big difference if its roughed up slightly with a fine sand paper before hand to give the adhesive a better surface to bond to. Although E6000 is a stronger glue when it comes to leather I don’t think it gives as good a bond. Hi, I was wondering what type of glue you recommend for gluing flat back swarovski rhinestones to Authentic Ugg boots. Thanks so much for the helpful information! I have tested gemtac, e6000 and epoxy resin all give a good bond but when you try and pick the crystals away the gemtac comes away quite easily where as the other two are quite difficult to pick away. When you use e6000 on suede it doesn’t seep into the fibres but just sits on the surface so you need to force it down, you can do this by holding down each crystals for an extended period (30 seconds) or the best way I found was to apply a few crystals and then using a small ruler press down and hold for a while to ensure the bond is strong. On a test with some crystals applied using e6000 the way you would on a converse toe (quickly) and the holding down method, once the glue was dry the quick way crystals picked off easily where as the other method the crystals were difficult to pick away. As regards epoxy resin although the bond is strong if the glue seeps out from around the crystal it darkens the suede giving stain marks which you don’t want, so of the 3 I would recommend e6000. I am starting a small T-shirt business and I want to apply the swarvoski stones to the cotton Tshirts. Can you please advise what would be the best method to apply on tshirts glue or Hot fix ? I don’t want a customer to complain that after a few washes stones fell off. I also want to know which Hot fix tool you recommend also ? Thank you so much you have been so informative. Good luck with the new business. As regards crystals for a t-shirt I would definitely recommend Hotfix crystals, there is no mess with the glue and they wash well see our adhesives and hotfix machine wash test post here. As regards tools the best is the Kandi Professional Applicator tool in my opinion. You can also look at a stencil machine for creating templates for various crystal designs on the tshirts which will save a lot of time of you are creating multiple quantities of the same design. Hi!! I will be making decorated pointe shoes but I a really struggling to find the perfect glue!! Pointe shoes are made out of satin and I’m sticking rhinestones and metal broaches on so would Gem-Tac work? And is E6000 really bad for you? I’m worried about E6000 because its toxic? Please help me out! Gemtac will work but e6000 will be the stronger option, the alternative is to use HOTFIX crystals but you will still need some adhesive for the metal broach for which e6000 again would be the stronger option. E6000 does have toxic fumes for which you can buy a mask from a diy store to protect against the fumes if you are worried. The masks have cartridge filters to block out any nasty paint, glue or chemical fumes from similar products. Depending on the glue you have used and the fabric will determine if the adhesive can be removed from the fabric. For a lot of adhesives if you wash on a hot temperature the glue will melt, it’s then easy to pick off the adhesive once it’s fresh out of the machine while the clothing is still hot (Bear in mind that washing crystals this way may not only remove the small glue stain but strip all the crystals of the fabric so if there are crystals on the garment you don’t want removed this won’t work). Another alternative is nail varnish remover, but you will need to check the fabric first to see if it can withstand a hot wash or if nail varnish remover will damage the fabric. The third option for removing adhesive is dry cleaning, where the chemicals used in dry cleaning will often degrade glue unless it’s dry clean safe in which case the adhesive wont be harmed. If all fails your final option will be to apply larger crystals over the adhesive stains, this time when applying the crystals only use a small amount of adhesive so that it doesn’t splodge around the outside of the crystal. Fantastic review and very helpful for our research! 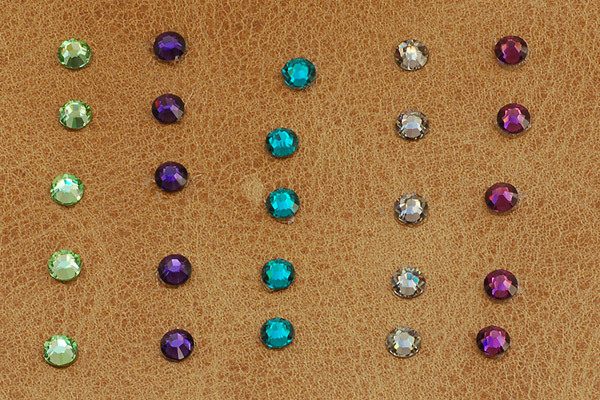 As we are experimenting with crystal embellishments on leather or faux leather this is extremely helpful. E6000 should give a strong bond, it’s clear and suitable for plastic as long as the crystals you are using are crystal/glass and not acrylic. Hi I am wanting to glue rhinestones onto my motorcycle. Do you know what would be best to use for it which will be in heat, cold, be exposed to the sun and vibration from the bike? Hi Sarah I would suggest looking at E6800 INDUSTRIAL ADHESIVE, its the same family as e6000 but for outdoor use, it’s non flammable once cured, UV stable resists cracking and yellowing outdoors, salt water resistant, bonds items subject to vibration, flexible and can withstand temperatures between -40 °F and 150 °F (-40 °C and 66 °C). I’m trying to bling a pair of rubber sandals (havaiinas) but E6000 glue goes soft, and stones slide off. I’m desperate for help! At present there isn’t an adhesive that doesn’t soften but I am testing some more glues hopefully one of which will help. what is the best glue to use to apply swarovski crystals to a cathedral tulle veil. I have E6000, but I think it may be too heavy of a glue. Hi Sue you can use it but apply using a cocktail stick so that you only get a tiny bit on at a time and it doesn’t splodge out around the sides of the crystals. If you aren’t happy with e6000 then opt for gemtac which will also give a strong bond. Hi I came across your website and love how you tested different glues. I already use a few of these and they work great. However I’ve been researching on what glue would be the best for metal but not just metal a metal that may get hot. I am doing some parts on a motocycle and a few parts will get warm/hot. I know it can be done there is a company out there that already does it and when I asked them they just said they use a heavy duty glue that have been tested. Could you point me in the right direction? Thanks! There are a few clear glues that are used for ovens I would be inclined to give one a test and see what the bond strength is like. Is the Hotfix crystals good for velvet, satin and lycra? You can use hotfix crystals on satin or lycra or non hotfix crystals on all three materials (both are sensitive materials to heat so take care as to the pressure and duration of holding the hotfix tip on the fabric). A good way to test if hotfix will give a good bond is to put a drop of water onto the material, if the water is absorbed into the fabric then hotfix should be fine. If on the other hand the water sits as a drop on the surface of the material, consider using non hotfix because the hot glue is unlikely to provide a strong long lasting bond. Wondering if/how you can glue these stones onto fabric that has spray paint on it. Am wanting to paint a design and then add stones to accentuate the design further. I haven’t crystallized spray paint on fabric but would think that gemtac or e6000 would work for bonding crystals, if the paint is plastic I would test a small area first before going ahead with e6000 just to be 100% sure but gemtac will certainly work. As far as I know Tibetan charms are on a solid metal so you can use epoxy resin or gemtac, epoxy would likely be the more hard wearing of the two as long as the surface doesn’t bend and once set the crystals should be on there for good. Hi Donna E6000 will give a good strong bond but if its on an area with a lot of flexing (around the part of the shoe that bends/creases) you will lose crystals. Hi i want to put rhinestones and crystals on shoes made of rexine or pu leather which glue is best. I haven’t found a glue that works well on leather or synthetic leather unfortunately, no bond seems to be long lasting of the adhesives I have tested on some fake leathers gemtac is better on others e6000, but the bond is never as strong as on rubber or plastic and is easy to pick off the surface. If they are Swarovski flatback pearlsd then the chances are they are hotfix so you will be able to apply them with an iron or hotfix applicator tool. For sequins I would opt for gemtac or e6000 adhesive where gematc is the easier to use and non toxic, but e6000 is a little stronger being an industrial strength glue that doesn’t deteriorate when machine washing. Thanks for such an informative post and for taking the time to answer comments! I’m planning to crystal a satin covered steel boned corset and wanted your opinion before starting. I assumed e6000 would be the best bet but as the corset will bend and shift during dressing, I was unsure whether this glue would hold up to that kind of stress. Any advice? Hi Kit sorry for the delay have been off for a few weeks after having an op. 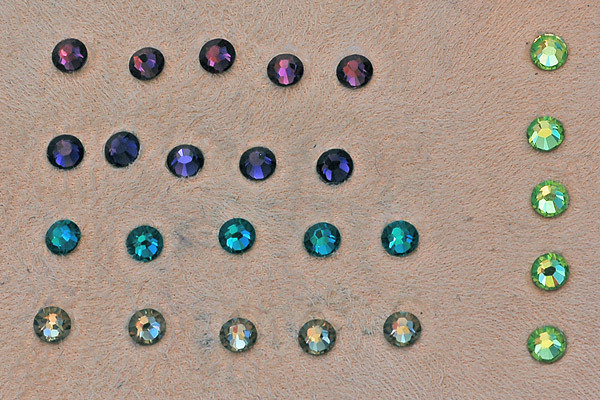 Have you considered sew on stones, something like the Xilion Lochrose 3128 which looks like a rhinestone with a hole in the centre would work. You can either use a clear thread and pass through the centre hole, through a tiny seed bead and back through the same hole securing the crystal in place, or through the centre and around the side. There will be no worry about crystals coming loose then from the corset fabric flexing. As regards going down the flatback route you can use gemtac, e6000 or hotfix crystals on Satin fabri but the hotfix or e6000 would give the stronger bond and hotfix being the least messy of the three. Nothing bonds very well or long term to leather so I would try and stay clear of crystallizing leather or imitation leather. I think I know the case you mean its the silicone plastic flexible case which if it is again you are not going to get a satisfactory long term bond sorry. Unless its metal or hard plastic I would be a little dubious about spending a lot of money crystallizing a phone case as its not going to last long before you start loosing crystals. As regards adhesive for harder plastic phone covers I would either opt for e6000 or 2 part epoxy resin (make sure its one that has enough working time to position the crystals and is UV stable). This is such a great post! I’m new to trying to bling things out and I’m wanting to put Swarovski flat backs on an Apple Watch cover and band. The cover would be made of plastic or metal (I still haven’t decided because I don’t want to purchase until I know I can successfully glue rhinestones to it) and the band was going to be either leather or metal (again I wanted to be sure I could be successful). Is there still nothing that successfully glues long-term to leather? If I simply got metal, what would be the best glue? Is silicon not an option as a gluing surface at all? I would opt for metal rather than leather as the bond will be strong on metal but not long lasting on leather. As regards what adhesive to use you have the option of e6000 if any of the parts are flexible or are going to take a knock as the rubber adhesive will act as a shock absorber. The other option is epoxy resin which sets into a very tough strong resin that has limited flexibility but epoxy is good for any non moving metal parts. Hi! I want to glue rhinestones on the 3 stripes of my adidas superstars. I’ve seen these on etsy, but they are so expensive and I know it’s easy to do..I’m just not sure what glue to use. The adidas are leather.. What do you think? I’ll appreciate any suggestions please 🙂 I can’t wait to bling out my shoes! Unfortunately there is no adhesive that gives a satisfactory bond for crystals and leather of the adhesives available e6000 would probably be your best option. Make sure that there is no wax/polish or any grease on the stripes before crystallizing. Hi, love your artical and am curious to know whether you tested the glues on the swimsuit and what was your verdict? I will be attaching all different types of gems but want a glue that will dry strong and clear and stretch with the swimsuit. Also withhold the chlorine, washing and heat. Hi Jade I would probably opt for hotfix crystals if you are going to crystallize a swimsuit as they are widely used for dance costumes that get washed frequently, the only issue will be the chlorine which hotfix crystals especially the newer style are more resistant too. 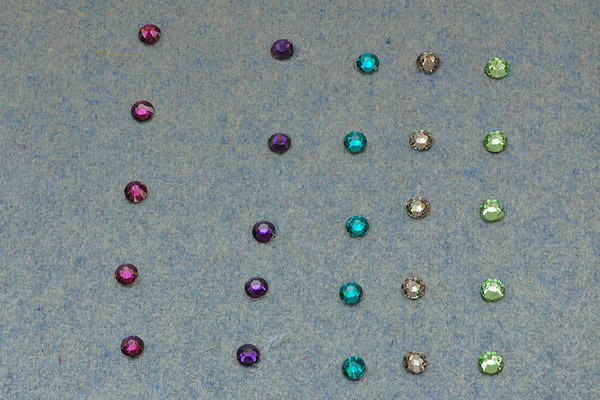 I have a small business and hand stick a vast quantity of rhinestones on a daily basis to fabric (mainly satin, cotton). – If you make a mistake, the glue is easy to peel off without leaving a mark the majority of the time. – The rubber like consistency when it sets makes it suitable to use when the article needs movement in it, as the crystals will not ping off. – The glue will sometimes melt the back of the silver foil on acrylic rhinestones (the only rhinestones I use). So sometimes the crystals can start to look cloudy or the actual crystal will come off and the silver foil stays attached to the fabric. -The glue dries very quick, so I am constantly having to clear the opening of the tube, where dry glue builds up. It does become very wasteful and slows the process down. I have recently started to use a large nozzle, which does to some extent help reduce waste, however glue does continue to seep out of the nozzle once its squeezed. I will then need to wipe this glue away to get some fresh glue. 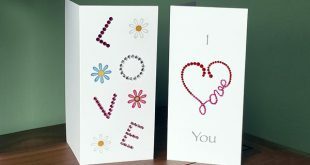 – It is quite a thick glue and does take a lot of practice to get the application of it just right. I only use the ‘Medium’ viscosity (also comes in high viscosity), which is a good consistency, however you will find that the glue is quite stringy. I use a cocktail stick to apply the glue and wind the glue around the cocktail stick to make sure I do not get long strings. – E6000 is quite hard to buy in terms of you can never quite match the picture to what you will actually be sent. Although the picture says medium viscosity, I am often sent the high viscosity which is difficult to work with. I have not yet found a glue to beat E6000, but my biggest concern about the glue is the strong fumes it gives off, which I worry is harmful as I use it on a daily basis. It is my understand that this a not a problem when the glue is dry, as it is just the vapours of the glue that makes it harmful. I do wear a mask with filters on and always sit with the window open, so I do my best to take every precaution. I am also thinking of having an extractor fan installed, which will help draw any fumes out. However, after much deliberation I have now decided that I should try and switch back to gem tac. I have found this the next best glue and although it does not have quite the same sticking power I am willing to compromise this as the glue is ‘non toxic’. So my question is, does anyone else use E6000 on a daily basis and have any concerns with it? I am not sure if I am being ‘over’ cautious, but as I said I do use a mask and sit in a well ventilated area. I am sure that there are plenty of other jobs where people need to work with similar substances (shoe makers?) so I am wondering what their option would be on working with glues? Also, if anyone uses a filter mask, which filters do you use? I am currently using a 3M mask with the organic ‘6055’ filters. Another question I have is about the longevity of gem tac. I am worried after time, does the gem tac deteriorate and the rhinestones loosen? (much like if you leave sellotape for a long time, it dries and becomes ‘brittle’). 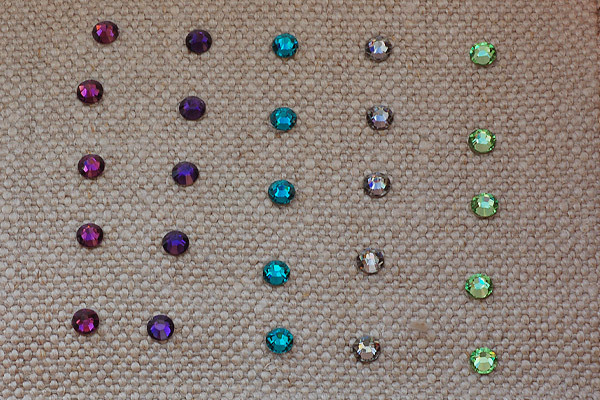 The advantage of my products is that they do not need to be washed and will not experience a great deal of wear and tear like rhinestones on a leotard for example, so switching to gem tac is not too much of a problem. I use the same mask as yourself for working with e6000 and yes it definitely is a big concern to use it on a daily basis without using a protective respiratory mask. As regards gemtac I still have crystallized products from 7/8 years ago with the crystals applied with gemtac that are 100% secure. One item is a hair brush which gets a lot of knocking around and subjected to heat but the crystals are all still fine. Gemtac I do find is a lot easier to work with (I use a cocktail stick) and has the advantage that it shrinks as it dries so if you are a little over generous it’s not such a big issue. The other issue with e6000 is that it will eat away the back of acrylic crystals over time and cloud the acrylic crystal face. Are any of these glues waterproof? E6000 and gemtac work pretty well in water after curing, but if the water is too warm gemtac does soften and then re harden when it cools. Hi I am making a piece of artwork for my downstairs bathroom. I’ve spray painted a wooden heart and want to stick rhinestones to it but the glue i’ve tried just makes them appear cloudy rather than sparkly. What would be the best glue in this situation please. Hi Samantha That would very much depend on the crystals you are using, it sounds like you are either using superglue and gotten it on the crystals face which will cloud the crystals, in this case you can change the adhesive for a wood glue, gemtac or e6000. If the crystals are acrylic it’s the chemicals in the adhesive that are clouding the crystals and melting the plastic foil on their backs. For acrylic crystals again you can use something like gemtac or wood glue, but stay away from e6000 or super glue. Hi! I am putting rhinestones (well, covering the entire thing) on an outfit that is 90% polyester and 10% spandex. It is a printed & very shiny spandex (called mystique seafoam mint from Jo Ann). I do not have a hot fix… what would be the best glue to use on it so as the rhinestones don’t fall off whenever i move?? Hi Giovanna E6000 would give the best bond, you do have to press the crystal into the glue/fabric to make sure it bonds with the fabric and crystal, but the bond is way stronger than gemtac or any other adhesive aside from hotfix. 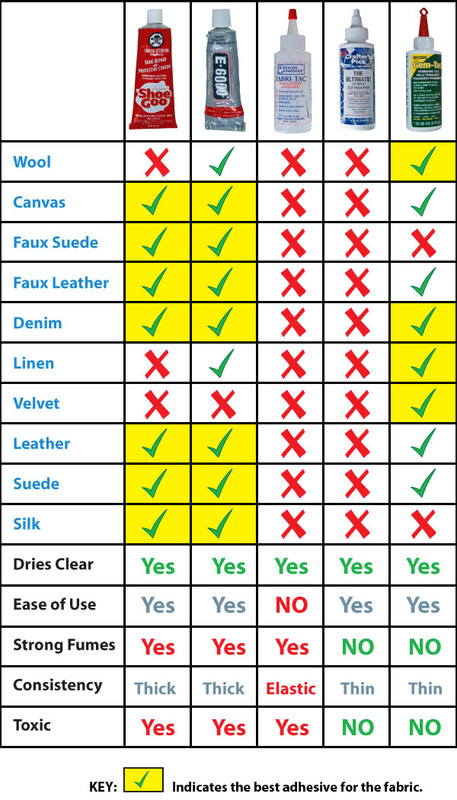 Is the “faux suede” you tested the same fabric as genuine Ultrasuede from Toray? Im not 100% sure but would guess it will give a very similar bond as it’s a synthetic suede just a different brand name. I want to put some crystals on the gas cap of my motorcycle. Best glue and prep for chrome. Thanks in advance for your assistance. Hi Kimber you will need to get an adhesive that doesn’t break down when it’s subjected to petroleum and is UV stable and possible heat resistant if the cap gets hot. There are suitable 2 part epoxy resin for metal that would be hard wearing it would also need to be UV stable, dry clear, won’t break down from exposure to petroleum and have a curing time of at least 5/10 minutes to give you enough time to work with. You can check an auto forum or industrial glue website and they should be able to advise which brand/model would be the most suitable. Ive not really found any adhesive that works overly well on leather long term. I want to protect the foil on the back of a large Swarovski rivoli for an open back bezel. Some have suggested clear nail polish. Others have suggested gluing on ultra suede with E6000. I have also heard that the E600 may affect the foil. Thoughts? Hi Linda. If your worried about the foil backing and you want to coat it with something to protect it, have you considered 2 part epoxy resin. It’s clear, easy to apply and extremely hard wearing and won’t peel away like E6000 can (a UV stable version also won’t yellow). Clear nail polish will give the surface a thin protective coat, but im not sure as to the longevity of the protection it will offer. What’s the best glue to use to bling out an acrylic mason jar? E6000, gemtac or epoxy resin will all work for an acrylic jar, of the 3 I would say epoxy resin will be the hardest wearing of the 3. The one down side of e6000 is that if a small amount comes away from the jar over time, if that adhesive is pulled it can pull away a big area of adhesive with the crystals attached. This isn’t going to happen if you are creating the jar for yourself as you would know better, but if they are being sold….